Located within lovely Belleview, Florida, is a beautiful, quiet haven welcoming residents of all ages. 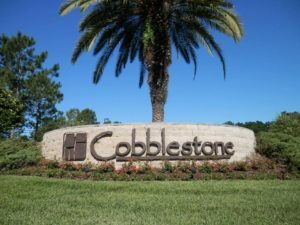 Continuing the classic small-town feel of Belleview, Cobblestone is a newer gated and deed-restricted community fronted by a stunning ornamental entrance featuring gorgeous landscaping leading to a beautiful community park. With underground utilities and old-fashioned street lights, you feel as if you have been transported back to a simpler era. Friendly neighbors greet you on streets lines with large, stately homes. Yet just outside the entrance and just a short hop away are the shops, restaurants, medical clinics, parks, Sports Complex, and a lovely library, as well as quaint downtown Belleview and dazzling Lake Lillian. You can choose from the amazing single family homes already here or buy a plot and put your own stamp on your custom home. With the homeowners’ association keeping the common areas lush and tidy, the pride of ownership shines up and down the streets of Cobblestone. Friendly and beautiful homes and community, award-winning Marion County Public Schools, and right in the heart of the Sunshine State.